I have rounded up some more great gifts for the men on your gifting list. You can read the first part of the men's gift guide here. The other gift guides published recently on the blog include the gift guide for fitness lovers and the stocking filler ideas. Let me begin with Braun who have a range of styling products which include the Braun Beard Trimmer featured in this guide. With 25 different length settings, the beard trimmer enables men to get the desired beard length they want. The highlights of the model include a Click&Lock trimming comb that makes precise grooming and trimming easy and the Slide&Style system which lets you style your beard with a simple slide even when the comb is on. A full charge takes around 8 hours and gives you 50 minutes of cordless performance while a 5 minute quick charge is enough for 1 trim. This great little flask from Zippo would make an excellent gift for the outdoors lover - probably someone who goes camping or fishing. With a sleek design, slightly curved for comfortable carrying, this stainless steel hip flask comes with a secured lid and doesn't leak. A beautiful flask that is reasonably priced. This razor uses Gillette's most advanced cartridge yet. Fusion ProShield lubrication before and after the blades helps to shield while you shave. In addition, the Chill features Cooling Technology during the shave. Other key features include the FlexBall Technology that responds to contours and gets virtually every hair and the 5 precision blades that ensure there is less tug and pull for incredible comfort. Homedics are one of the leading innovators in-home massage systems and the Shiatsu Max 2.0 back and shoulder massager is one of the most revolutionary massage systems they offer. With 14 massage programs with variable intensity Shiatsu, Rolling and Spot massage for the back and Vibration massage for upper legs and thighs, the Shiatsu Max 2.0 is one of the best massagers in the market. The height and width of rotation can be adjusted to suit you and there is also a heat setting which relaxes the muscles. There are 4 rotating balls and these can travel up as far as your neck, offering a nice neck massage. If you know of someone who leads an active lifestyle (someone who is into sports, horse riding etc.) or someone who simply enjoys a good massage, then the Shiatsu Max 2.0 would make an excellent and much appreciated gift. If you are looking to buy a gift for a whisky lover, then you will find a very good selection of spirits at 31Dover. One good choice would be the Crown Royal Whisky - a blended Canadian whisky which is one of the top-selling Canadian whisky in the United States. It comes beautifully packaged and would make a lovely gift for a whisky lover. Read more here. Know a music lover? 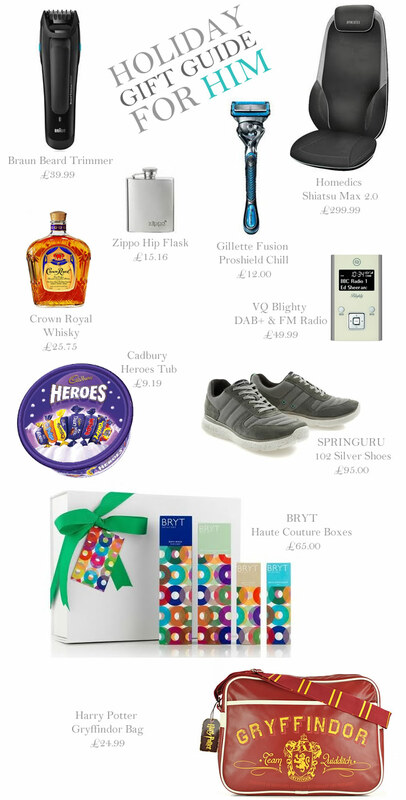 The VQ Blighty DAB+ & FM pocket radio would make an ideal present for them. Blighty features a high quality anodised aluminium finish in a choice of colours and would be your portable partner to keep listening to your favourite digital or analogue radio stations wherever you go. With auto tune, auto scan and with a battery life of up to 10 hours between charges, the Blighty looks great, offers good FM quality and is competitively priced. Inspired by the mattress industry and designed for total comfort, each pair of Springuru shoes contain 34 micro pocket springs built into the midsoles. The result - a shoe that offers great cushioning and literally adds a 'spring' to your step. The lace-up casual trainer featured in this guide is priced at £95 and offers the comfort that you would expect from very high-end trainers. The shoes are light-weight and comfortable. Read the review here. For the chocolate lover, Cadbury have a lovely range for Christmas. You can choose from various Christmas sharing baskets and giant selections or pick individual products like the large size Heroes tub that includes Dairy Milk, Dairy Milk Caramel, Éclairs, Fudge, Twirl and Wispa. Perfect for sharing. Looking for a gift for a natural beauty obsessed friend? Why not gift them an exclusive Haute Couture gift box from BRYT Skincare? BRYT, founded by Catkin Wemyss-Bodmer, are a British skincare brand who are known for their cruelty-free, natural skin and body care products. Featuring a selection of premium, hand-picked products from this British botanical range, BRYT’s Xmas Gift box for Him includes BRYT Hair & Body Wash, BRYT Foaming Cleanser, BRYT Shave and BRYT Moisturiser. The box is hand-wrapped in BRYT’s signature colourful tissue paper making it the ultimate natural skincare gift for men. A stylish sports bag featuring the Gryffindor crest and 'Team Quidditch' wording, this Harry Potter bag has a vintage-effect, distressed design. It is perfect for the lover of Harry Potter series. This officially licensed merchandise has an adjustable shoulder strap, an internal zipped pocket, external front pocket and metal studs on base and in addition to a sports bag can also be used for school or university as it is large enough for A4 folders. If you are looking for a trendy gift, then this one fits the bill perfectly. Totally Funky stock other quirky gifts like the Darth Vader cookie jar, Skull shaped beer glass and mugs and the Batman wash bag to name a few.